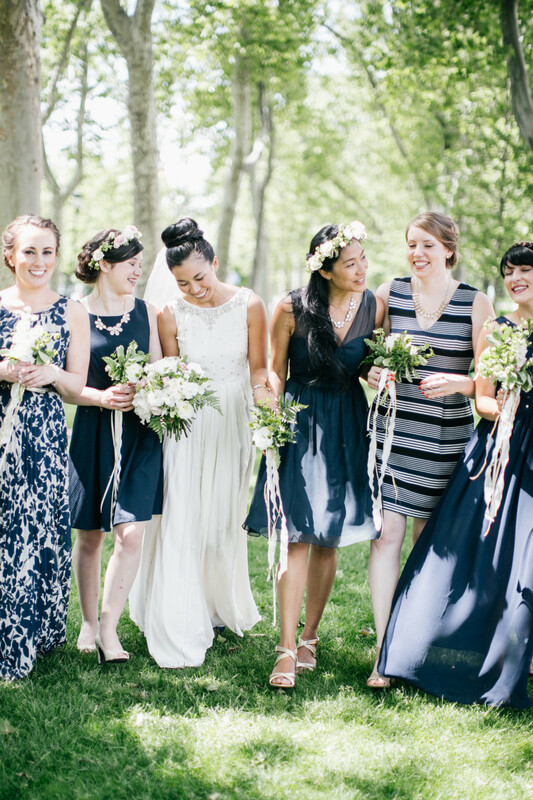 The only thing harder than finding your wedding dress is finding your bridesmaids’ dresses. You’re probably already preparing yourself for the onslaught of complaints: “This color clashes against my skin tone”; “They don’t have this style in my size”; “I will never wear this again.” Appeasing four or more bridesmaids of differing body types, skin tones, and tastes with just one dress is close to impossible. 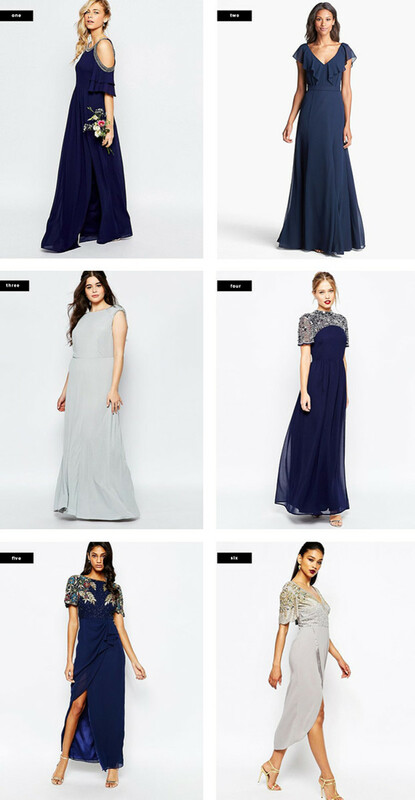 This is where the increasingly popular trend of mixing and matching bridesmaid dresses comes in. This gives you the freedom to choose a variety of dresses as well as allows for more creativity with your bridal party looks. Admittedly, not having the same dress means that you have to be more strategic in your guidelines to each bridesmaid. For a little mix-and-match inspiration, we’ve rounded up some gorgeous real weddings with mixed dresses and how to make this work for yourself. You know how some bridesmaid dresses look, well, like bridesmaid dresses? If you’re wanting to go a more unconventional route, we suggest getting fancy with embellished detailing. Intricate shoulder beading adds an element of fun and regality; plus, it shows off your glitzy side. To recreate this look for your bridal party, we suggest sticking to elegant colors that tone down the intensity of the bejeweling, such as navy and silver. If having all of your bridesmaids decked out with beading is a bit much, try incorporating two or three simpler dresses in the same color and fit. The key is keeping your bridal party cohesive, so make sure each dress has an element that ties them all together. For example, mimic the embellished-sleeve dresses with other dresses that have similarly shaped sleeves—even if it’s in a different fabric. Also, unify the dresses with the same waistline so that your bridesmaids are all essentially wearing the same style of dress. 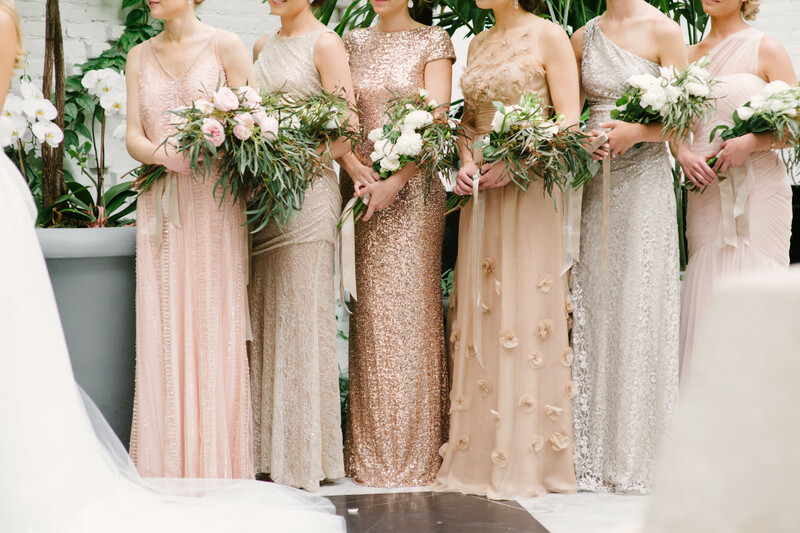 If you are swooning at this sparkly rainbow of blush tones, you’re not alone. Mastering this look isn’t as easy as it seems, though. 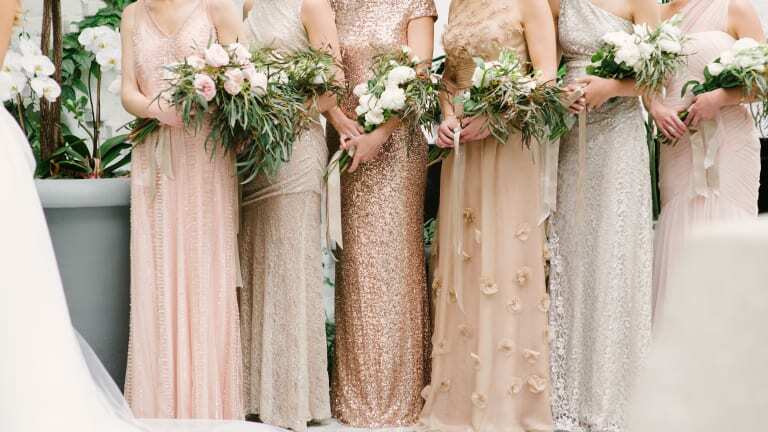 Before you tell your bridesmaids to pick out “sparkly dresses”—or even “sparkly pink dresses”—consider narrowing the choices down to a particular tone, such as these blush and champagne colors. The dresses below are technically pink, but instead of a blue undertone (which makes a more bubble gum pink), you want a paler orange undertone to achieve that neutral blush color overall. Now for the fun stuff—sparkles. You don’t want to go overboard with making every single one of your dresses head-to-toe sequins. Add some variety by including dresses that have beaded designs rather than sequins or dresses that have a metallic rose gold sheen. Get creative with each dress’ sparkle factor, and use different types of beads or sequins. 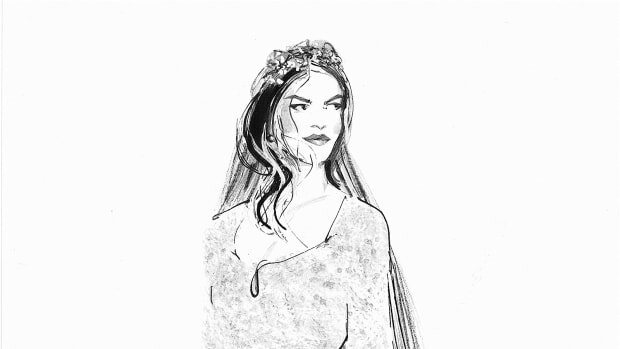 Also, remember to include some dresses that don’t have as much sparkle or simply have a lace design that mimics the designs of the other dresses. 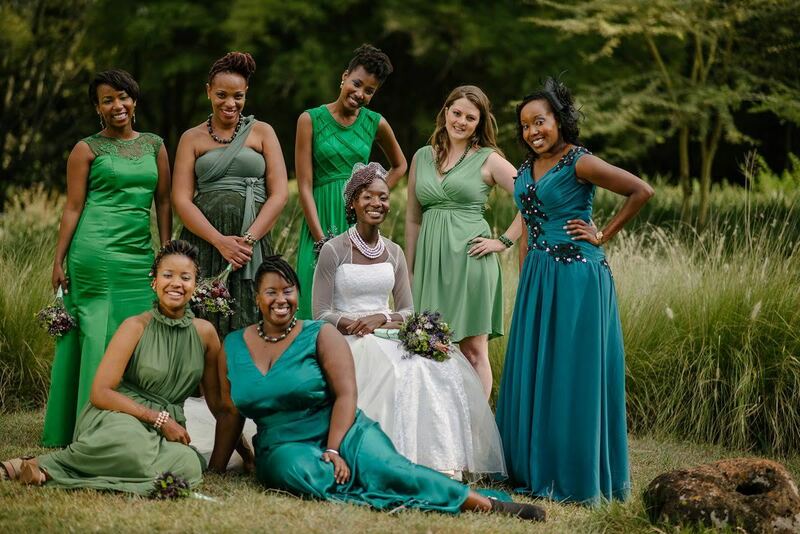 Green is a tricky color to pull off for a whole bridal party, but when you incorporate a variety of green tones that hedge on turquoise and aqua, the end look is much more luxe. Start by choosing your absolute favorite green, and then add on similar green and blue colors that complement it. Emerald and turquoise are both luxurious jewel tones that flatter each other in their bold and rich hues. Once you have turquoise in the bunch, it’ll be easier to start incorporating blues that have a green tinge to them, such as aqua. Similarly, because emerald is still on the scale of green colors, start adding in yellow-greens such as clover and even army green to create some experimental juxtaposition. 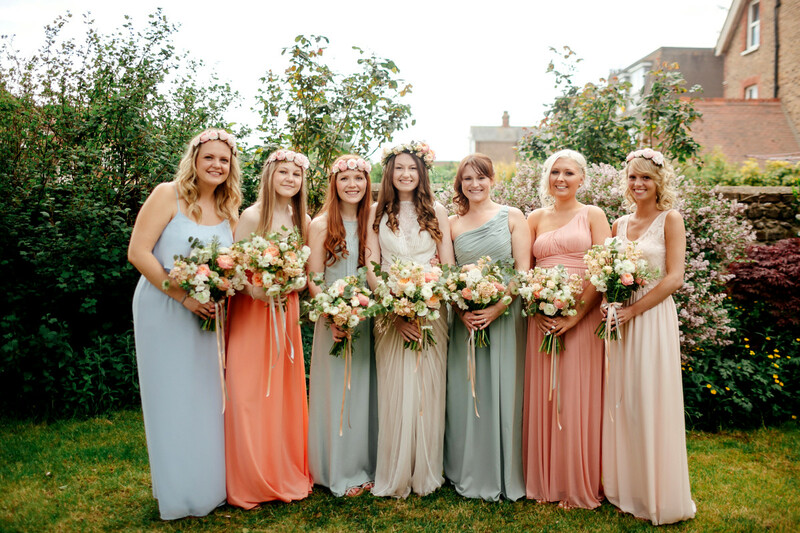 Pastel bridesmaid dresses have become increasingly popular over the years, but there are still unique ways to execute this theme for your wedding. For this look, begin by choosing a similar dress style, but allow for varying necklines and straps. Again, to prevent fit problems, choose a universally flattering fit to accommodate the differing body types of your bridal party. An A-line dress that hits right at the waist looks great on everyone. 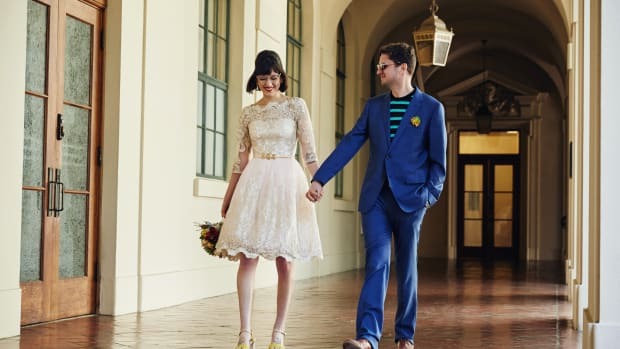 For your pastel colors, we suggest choosing two intensities of green, pink, and blue. For example, choose a light baby pink and a brighter coral pink, a muted baby blue and a bright sky blue, an aquamarine green and a mint green. The two intensities of each color in slightly differing tones will look less contrived and more creative. 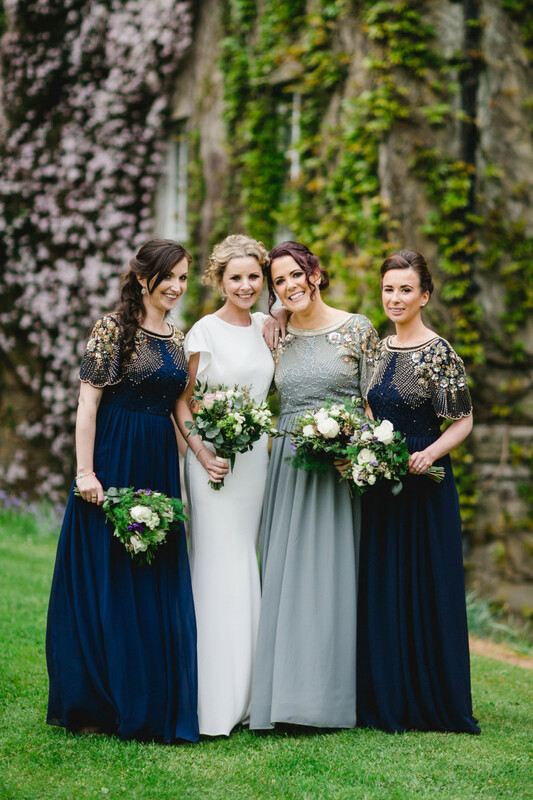 Who said bridesmaids are supposed to blend into the background? If you’re a bride who wants her bridesmaids to pop, try making bright colors and metallics the theme of your bridal party. Neon colors are not off limits; they just require expert balancing with non-neon colors. 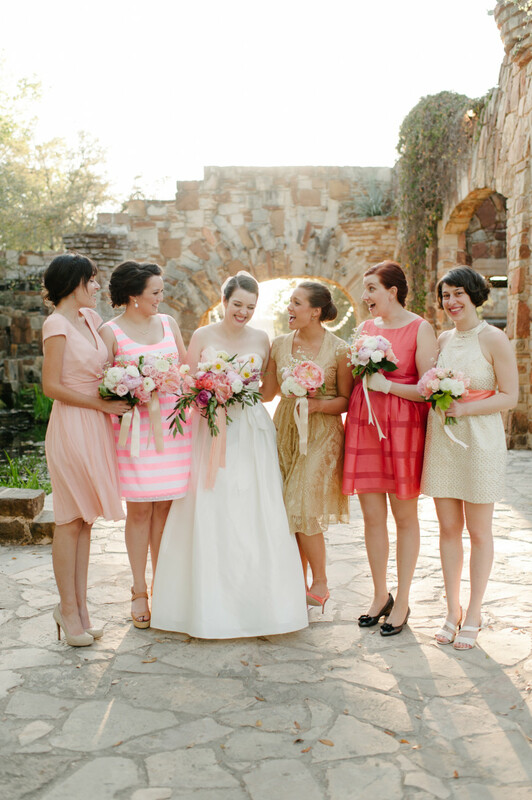 The bride above chose pink and gold for her bridesmaids and then explored the intensities of each color. With the solid deep-gold dress and the striped neon pink dress as her two boldest dresses, she then matched them with dresses that were similar but less intense—for example, another lighter gold dress versus the light pink and rose dress. Begin by similarly choosing your own two tones, and explore the intensities of them. To make these two colors blend, we picked dresses that incorporate the lace design of the solid gold dress. The pink lace dress is similar to the gold lace dress, making a more cohesive transition into the solid pink dresses. 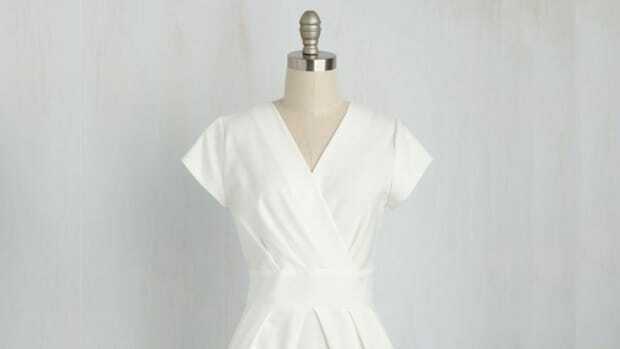 Because the two colors are already so different from each other, we suggest picking the same fabric and length for all the dresses to keep the bridal party looking like the bridal party—and not wedding guests. 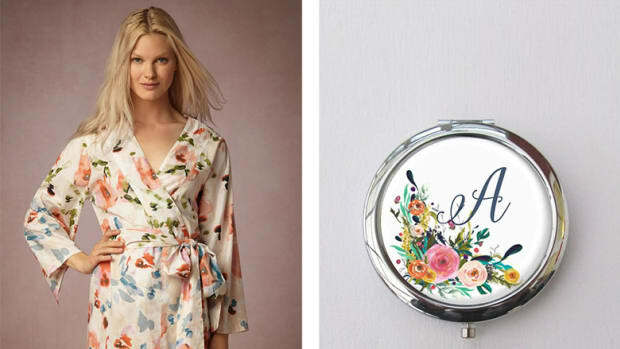 If you’re a laid-back bride, this is the bridal party look for you. Get quirky with different prints and lengths, but keep the overall look united with a black-and-white color scheme. 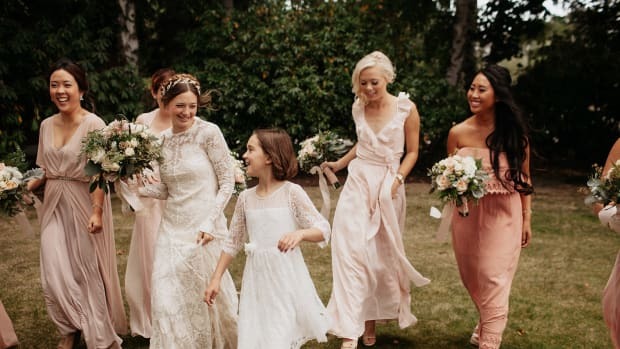 If you’re nervous about the bridesmaids looking too disconnected, keep the style of the dresses the same—for example, fit-and-flare dresses with similar necklines, sleeves, or details such as mesh. If you keep the waistlines and most of the necklines consistent, you can experiment with varying lengths of the dresses. Because the color palette is easy to coordinate, try a couple of funky patterns thrown in for variety. 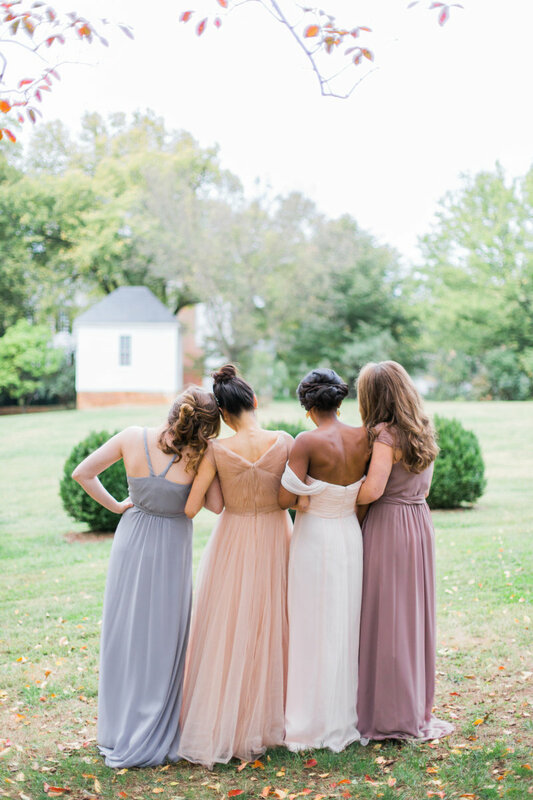 This bridal party look is all about muted tones that create an overall fresh yet classy approach to mixing and matching bridesmaid dresses. Instead of going for the bright pastel dresses, look for the deep mauves, the brooding grays, and the dusty roses. By simply being muted, these tones will immediately create a cohesive flow to your wedding party. Look for dresses in lightweight fabrics such as chiffon and tulle to create a whimsical appeal that suits the romantic color scheme. 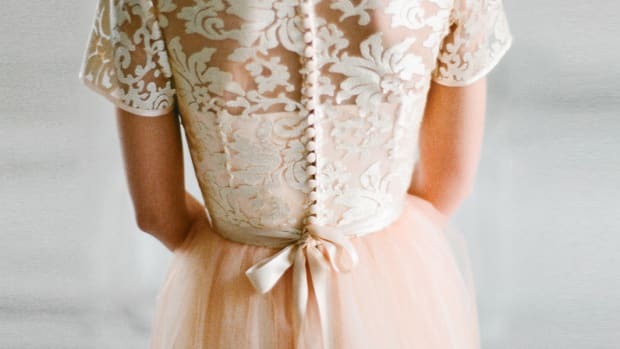 Keep in mind similar details throughout each dress, like a wrap bodice, lace, and a high waistline. If you have a junior bridesmaid or want to make your maid of honor stand out, put her in a shorter dress that has similar lace details to the other dresses.